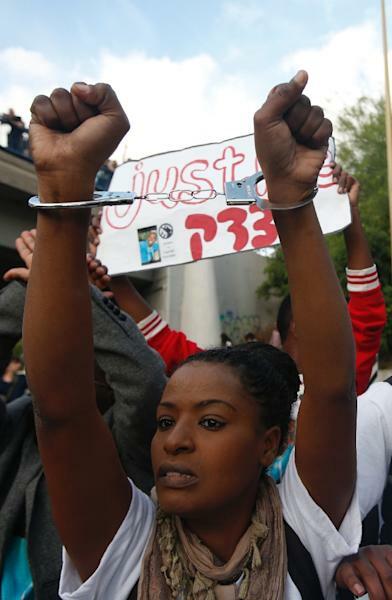 Tel Aviv (AFP) - Police fired stun grenades to disperse a rally by Ethiopian Israelis demonstrating in central Tel Aviv on Sunday against alleged police brutality and widespread discrimination. 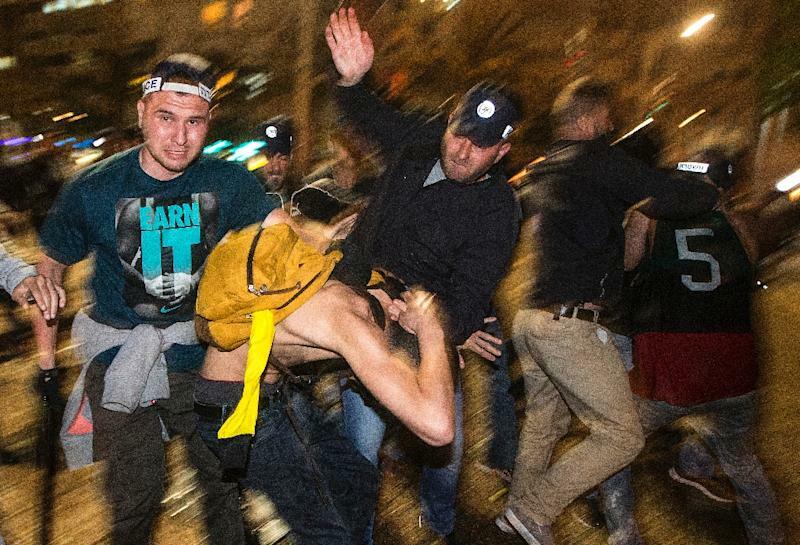 Some of the demonstrators hurled stones, bottles and chairs from nearby restaurants after attempting to storm the Tel Aviv municipality building. Mounted police used riot stun grenades and water cannon as well as pepper spray to disperse the crowd and clear nearby streets, but an AFP correspondent said the protesters kept returning. Police said 46 officers as well as at least seven demonstrators were wounded in the clashes, and 26 protestors were arrested. Internal Security Minister Yitzhak Aharonovitch said dispersing the "riot" was difficult since it had no clear leadership. "There is nobody to talk to," he told reporters. Sunday's protest came three days after a stormy demonstration in Jerusalem sparked by footage showing two policemen beating a uniformed Israeli soldier of Ethiopian origin. Scores of other Israelis also joined Sunday's rally, chanting and holding up signs reading: "A violent policeman must be put in prison" and "We demand equal rights". As they marched through Tel Aviv, some held their arms up in the air with their wrists crossed as if handcuffed. Demonstrators earlier blocked the Ayalon expressway during rush-hour, causing huge traffic jams on one of Israel's central highways before police forcefully evacuated them. "Being black, I have to protest today," 34-year-old Eddie Maconen told AFP before the clashes outside the municipality. "I never experienced police violence against me personally, but it is aimed at my community which I have to support," he said. Maconen, who came to the country aged three, said the protesters wanted violent policemen to be put on trial before deeper issues of social inequality were tackled. "First the police need to be dealt with, then we'll get to all the other (official) bodies that screw over Ethiopians," he said. Police estimated 3,000 people took part in the demonstration, while media reports cited organisers as putting the number at 10,000. Zion Cohen, an Israeli participant, told AFP the Ethiopians were "a hundred percent right" to protest. "It's a racist country and we don't accept them," he said. As the rally began, Prime Minister Benjamin Netanyahu released a statement saying that on Monday he would meet Damas Pakada, the soldier who was beaten, as well as other representatives of the Ethiopian community. "All claims will be looked into but there is no place for violence and such disturbances," Netanyahu said. Economy Minister Naftali Bennett met with protesters at the scene of the clashes and said Israeli society faced "serious soul-searching." "While the law must be kept, we must all seek the real solutions for the problems that have surfaced in such a painful way," his office quoted him as saying. Police pledged a crackdown on those members of the force who have used violence against the Ethiopian community after the video footage went public. More than 135,000 Ethiopian Jews live in Israel, having immigrated in two waves in 1984 and 1991. But they have struggled to integrate into Israeli society, despite massive government aid. 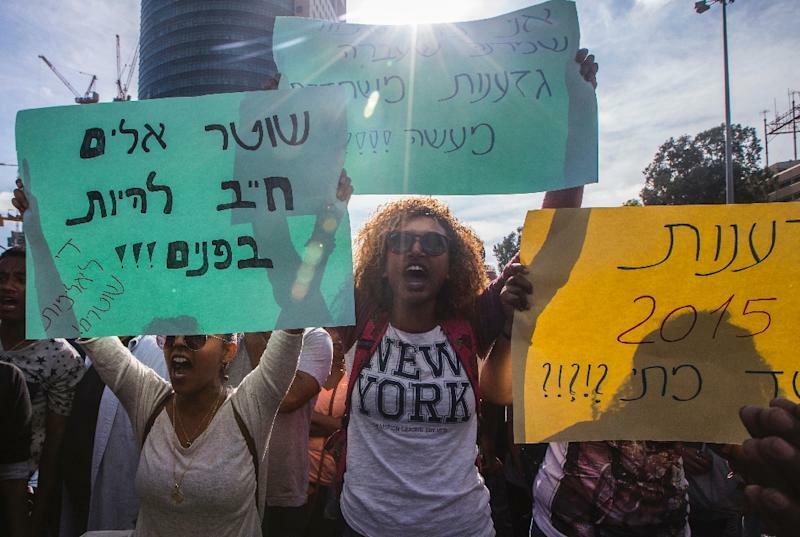 While Ethiopian Jews have high rates of employment, their average income is lower than that of other Israelis, and they are under-represented in academia and public office. Officials said that approximately 20 of the minors held in juvenile prisons were of Ethiopian descent.